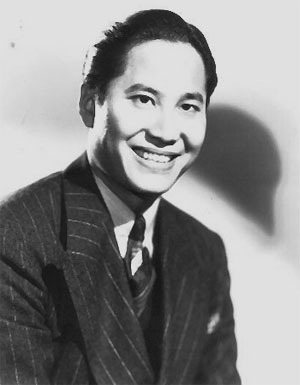 Above: A studio publicity portrait of Keye Luke circa 1940. Luke was born in Canton, China, to Americanized parents who were revisiting their homeland. He grew up in San Francisco, where his father owned an art store. The family later moved to Seattle, where Luke studied art and architecture at the University of Washington. Upon graduation, he pursued a career as a commercial artist; by the early 1930s, he had returned to California to work as a publicity artist for Twentieth-Century Fox, and, later, RKO. He performed his first on-camera movie assignment (narrating a short about China) while at RKO, and decided to go into acting full-time, beginning in 1934. After playing a few bit roles, he was contacted by a friend at Fox; the studio was seeking an actor to co-star in their series of Charlie Chan whodunits, someone would could provide both comic relief and youth appeal. Luke signed a Fox contract and appeared in his first Chan outing (Charlie Chan in Paris) in in 135. In this and subsequent Chan films he played Charlie’s eager but rather impetuous “Number One Son” Lee, a fumbling but likable Everyman who contrasted nicely with the stoic and near-infallible senior Chan. Luke, despite his lack of experience, took to acting quickly, with help from Charlie Chan portrayer Warner Oland, who became the young man’s acting mentor. Contracted to Fox, Luke continued in the Chan films until 1938, occasionally appearing in other Fox films or being loaned to other studios. Warner Oland died in 1938, calling a temporary halt to the Charlie Chan series; the same year, Luke’s Fox contract expired, and he decided to strike out on his own as a freelance actor. Luke’s freelancing period found him winning characters parts in both big (Paramount’s Dorothy Lamour vehicle Disputed Passage) and small (the Columbia B-thriller North of Shanghai) films. He appeared in his first serial, Universal’s The Green Hornet, in 1939. This cliffhanger, a faithful and well-done adaptation of a popular radio show, starred Gordon Jones as Britt Reid, a newspaper publisher who warred on the underworld in the guise of the Green Hornet. Luke was the editor’s Korean friend Kato, whose life Reid had saved years ago; ostensibly Reid’s valet, he was the Hornet’s trusty helper and the only one aware of the hero’s dual identity. He provided the Hornet with a gas-gun, a bullet-proof car, and other helpful crime-fighting devices, while also contributing physical assistance in tussles with heavies. As Kato, Luke was quiet-spoken and serious, whether he was assuming a humble valet pose or whipping up scientific marvels. His character wasn’t all imperturbable reserve, however; he brought real warmth to his scenes with star Gordon Jones, making Kato’s devotion to Reid and his cause seem quite heartfelt. Above: Gordon Jones and Keye Luke put the finishing touches to the Green Hornet’s car, “Black Beauty,” in The Green Hornet (Universal, 1939). 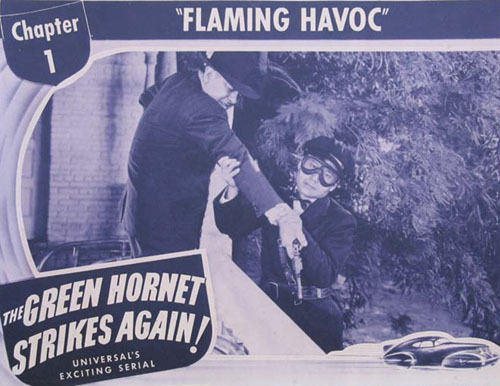 The Green Hornet was followed quickly by The Green Hornet Strikes Again (Universal, 1940), a very similar serial; Warren Hull replaced Gordon Jones as Britt Reid in this entertaining sequel, but Luke returned as Kato and put the same effort into his role that he had the first time around. His part in the sequel was considerably larger, however; he spent much more time discussing strategy with Reid than in the earlier serial and took part in the more of the action scenes. He was also less serious and more cheerful in demeanor than in the first outing, although not as chipper as he would be in his subsequent wartime serials. Above: Keye Luke disarms a thug in The Green Hornet Strikes Again (Universal, 1940). The next few years found Luke working chiefly in B-films for Universal (Burma Convoy) and Monogram Pictures (Phantom of Chinatown); however, in 1942, he signed a contract with prestigious Metro-Goldwyn Mayer. 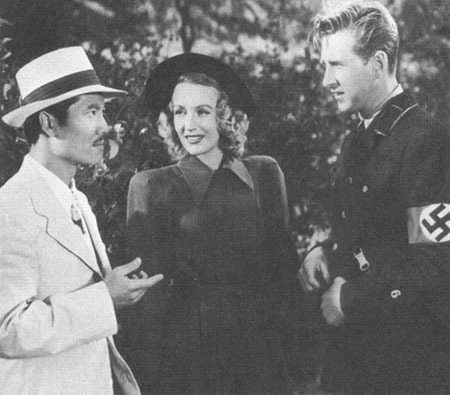 MGM utilized Luke in various World War 2-themed films (like A Yank on the Burma Road), usually as a Chinese foe of the Japanese, and loaned him to other studios for war-themed films (like Warner Brothers’ Across the Pacific, which gave Luke one of his few Japanese villain roles). 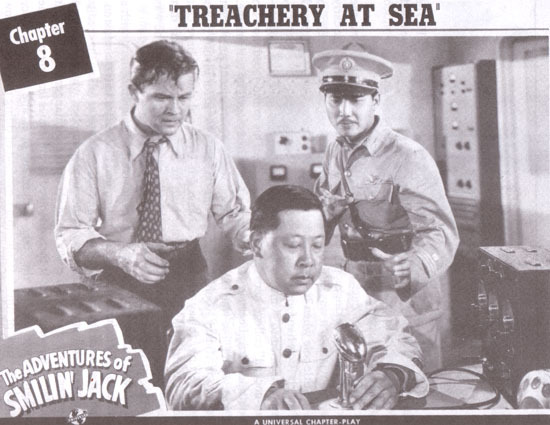 Another of Luke’s loan-out assignments while at MGM was the serial The Adventures of Smilin’ Jack, a war-themed cliffhanger that featured Tom Brown as Jack Martin, an American aviator who helped the Chinese battle an Japanese spy ring called “the Black Samurai.” Luke was Captain Wing of the Chinese Air Force, one of “Smilin’ Jack’s” trusty allies in his fight. Luke gave his part energy, good-humor, and an appropriately military assurance, but he shared screen time with an unusually large cast and thus had less to do than in the Green Hornet serials. 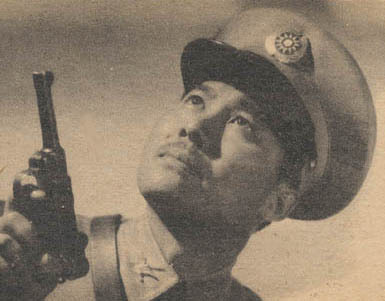 Above: A newspaper publicity portrait of Keye Luke as Captain Wing in The Adventures of Smilin’ Jack (Universal, 1942). 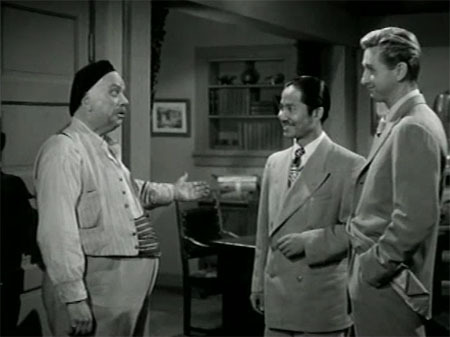 Above: Tom Brown and Keye Luke surprise a Japanese radio operator in The Adventures of Smilin Jack. Luke stayed at MGM for the next five years, playing a recurring co-starring role (interning surgeon Lee Wong Howe) in the studio’s “B plus” Dr. Gillespie films with Lionel Barrymore and Van Johnson. During this time, he appeared in other MGM features like First Yank Into Tokyo, and was loaned out to Universal for two more serials in 1945 and 1946. The first of these was Secret Agent X-9, another wartime serial set on a neutral Pacific island governed by an opportunistic crook (Cy Kendall). Lloyd Bridges played the title character, US agent Phil Corrigan, who was trying to stop the Japanese from acquiring a synthetic fuel formula. Luke, as Chinese agent Ah Fong, navigated the spy-ridden waters of Shadow Island with Corrigan–first posing as a card dealer at Kendall’s casino and then fighting the villains openly when his cover was blown. 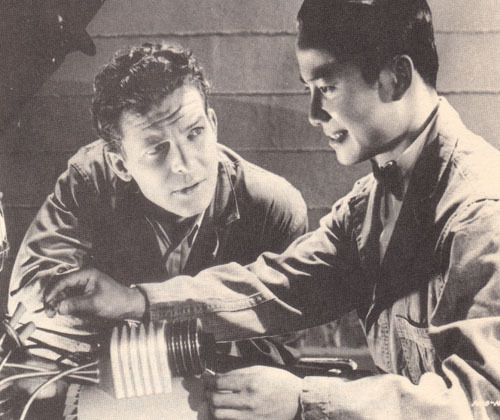 Secret Agent X-9, the best of Universal’s post-1943 serials, also gave Luke his best serial showcase; the Ah Fong character was quick-witted, suave, and courageous, and had nearly as much screen time as the hero. Luke invested this larger-than-usual role with all the charisma at his command, and established an excellent rapport with his co-star Bridges. Above: Keye Luke presides over the gaming table in the “House of Shadows” in Secret Agent X-9 (Universal, 1945). Edward Howard is on the far right. Above: Keye Luke and Lloyd Bridges discover that comic hotelkeeper Ferdinand Munier is on their side in Secret Agent X-9. Luke’s final serial was Lost City of the Jungle (Universal, 1946)–in many ways an inferior retread of Secret Agent X-9. This post-war espionage serial was set in a neutral polity much like Shadow Island (the Himalayan basin city of Pendrang, governed by an unscrupulous woman called Indra) and featured Luke as a secret agent again–this time Tal Shan, an operative of the World Peace Organization. Together with hero Russell Hayden, Luke tried to stop international spy and “warmonger” Lionel Atwill from getting his hands on a powerful element that could counteract the atomic bomb. Luke’s character was similar in personality to his earlier Ah Fong, and he worked well with former cowboy star Hayden. However, both actors were somewhat overshadowed by a complicated script and a too-large group of villains and quasi-villains who dominated a good deal of the production. 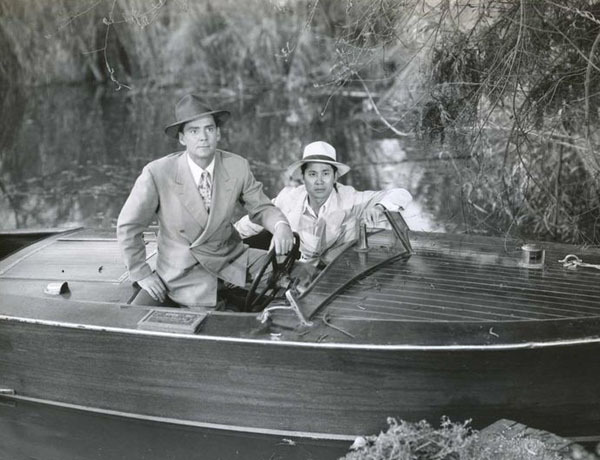 Above: Russell Hayden and Keye Luke in Lost City of the Jungle (Universal, 1946). With World War 2 over, movies featuring Chinese or Japanese characters became less bankable, and the 1940s found Luke’s screen work diminishing. He concluded his MGM tenure with the last Dr. Gillespie movie, Dark Delusion (1947), and began to freelance again. He worked chiefly on television during the 1950s–playing Oriental character roles in shows ranging from December Bride to Gunsmoke–but could usually be found in the cast whenever Hollywood produced a feature film with an Asian or Pacific setting (Hong Kong, Fair Wind to Java, and others). In 1958, he was cast as the patriarchal Mr. Wong in Rodgers and Hammerstein’s Broadway hit Flower Drum Song; he received excellent reviews and continued in the production for two years. He continued as a stage and television actor–while still making occasional theatrical appearances– throughout the 1960s. In 1972, he landed recurring roles on three different TV series–he voiced Charlie Chan himself in the Hanna-Barbera cartoon program The Amazing Chan and the Chan Clan, played the King of Siam’s chief councilor in a short-lived show called Anna and the King, and portrayed David Carradine’s blind mentor Master Po on the popular Kung Fu series. The aging Luke kept acting into the 1980s, now doing almost as much cartoon voice work (on shows like The Chipmunks) as live-action performing. He co-starred in one more TV show in 1987, playing another aged Kung Fu master in a Disney Studios series called Sidekicks; after three more years of acting, he finished his career in 1990 with a major role as a Chinese herbalist in the Woody Allen feature Alice. Keye Luke passed away in Whittier, California, a few months after Alice’s release. 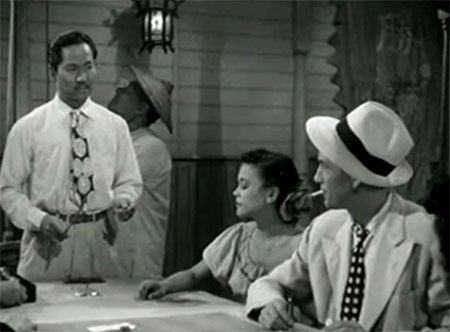 Lacking the aloofness of many of his Oriental acting contemporaries, Keye Luke was able to ”connect” with Occidental audiences despite his foreign background. His cheerful, appealing screen personality made him a fine foil to Charlie Chan, a perfect “Face of China” in World War 2 propaganda films, and one of the most personable and interesting sidekicks in the chapterplay genre. Above: Keye Luke discusses strategy with Jan Wiley and a disguised Lloyd Bridges in Secret Agent X-9 (Universal, 1945). Acknowledgements: Much of the biographical information in the preceding article is derived from Joe Collura’s article on Keye Luke in Cliffhanger magazine #13 (1990), a composite of two different interviews.